Mike Ashley returns Rangers' naming rights. Isn't that nice? Sports Direct loans the struggling club a further £1m, but this kindness comes with a cost. There's no such thing as a free lunch, but a £1m, interest free loan comes pretty close. Cash-strapped football club Rangers might be delighted, then, that its new bosom buddy Sports Direct raised its recent £2m loan to £3m. Just as important, symbolically at least, is the return of the Ibrox stadium naming rights, which Sports Direct owner Mike Ashley bought for a mere £1 last year. The more cynical sorts might wonder what canny businessman Ashley's up to. After all, he recently upped his stake in Rangers and provided the first loan as leverage to gain greater influence over the club's management, ousting rivals Graham Wallace and Phillip Nash and bringing ally Derek Llambias to the board. Extending the loan and returning the rights are likely to have been part of his plan to develop lucrative retail links between Sports Direct and Rangers all along. The club said last month that it would need more funds to keep it ticking over until the new year, and these funds were only ever likely to come from one source. Indeed, Rangers said today that poor attendence will mean it'll need even more than £1m over the next few months. Chances are Ashley was aware of this when he set the terms of the loan, which continues to give him leverage. The fruits of these deals are already beginning to ripen. The club announced that the deal 'consolidates existing marketing arrangements and results in a more normalised retail joint venture marketing arrangement in which Sports Direct will continue to have certain advertising rights', which in English means that Ashley got just what he wanted. The naming rights are small change (literally), but might earn some brownie points. 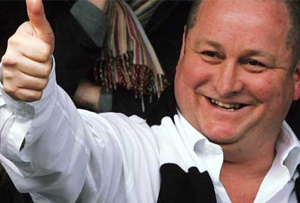 Acquiring those rights had made Sports Direct unpopular with fans, and Ashley needs someone to buy from his concessions in Glasgow, after all.